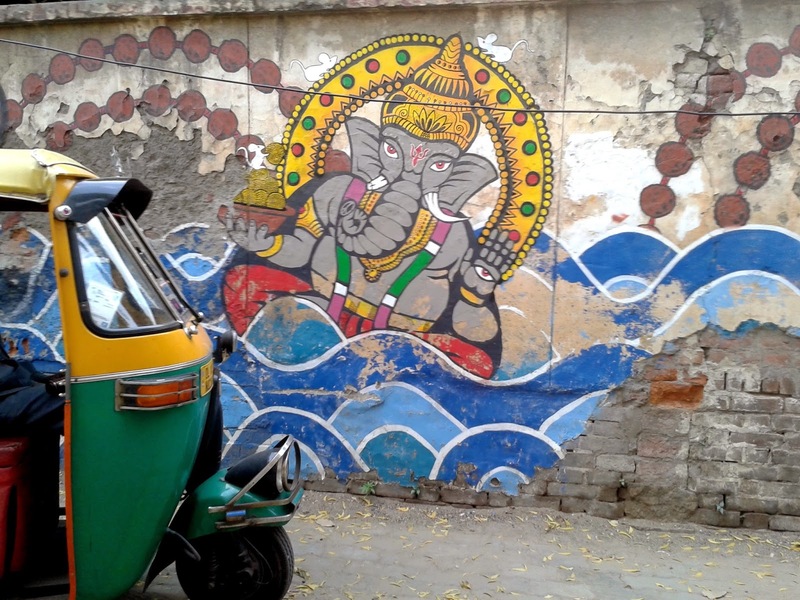 A day in Delhi : A city of cities ! 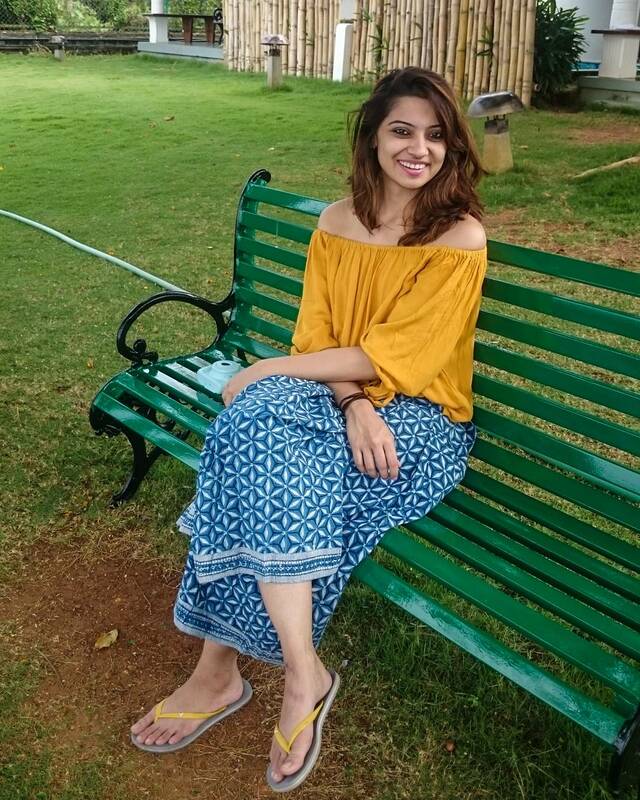 So last Sunday, I went exploring Delhi. 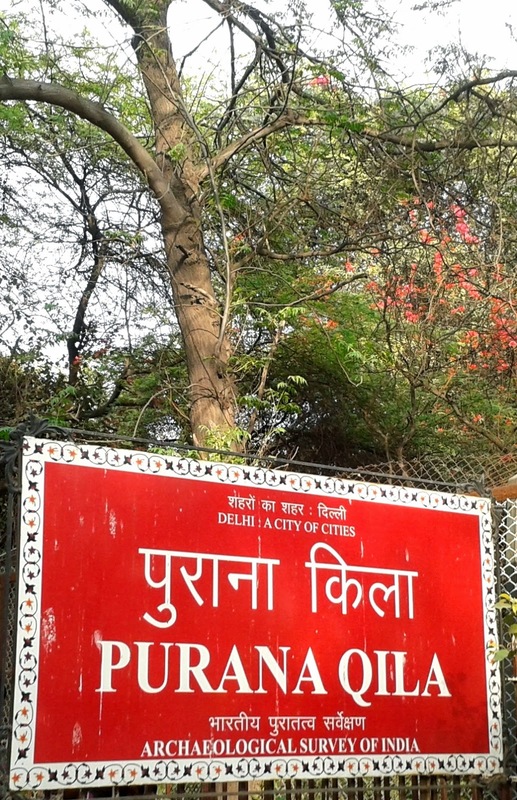 In spite of having lived there for so long, I realized I haven't seen all that there is - The Purana Quila or Humayan's Tomb for instance. Every time I leave Delhi, I crawl up on something and make a mental note - 'next time'. Last Sunday, it was perfect weather with a slight drizzle. 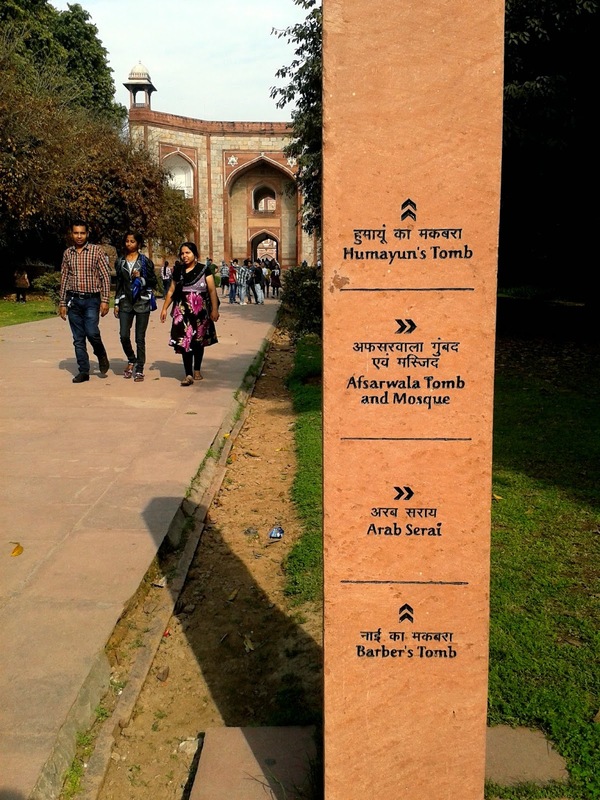 We went to the Purana Quila, Humayan's Tomb and Agrasen ki Baoli - all marvels from the past. The day also felt like a chapter from our history text books. To enter, there's a small entry fee. 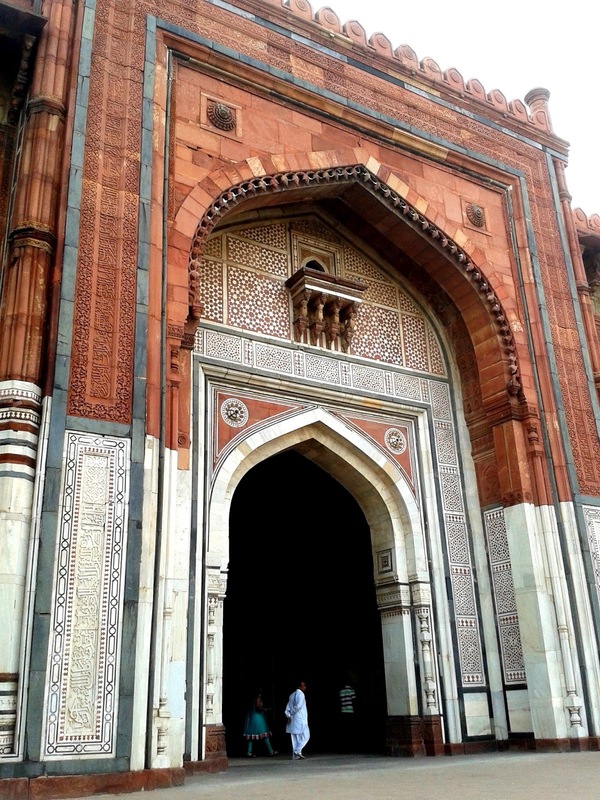 The architecture is in line with all other Mughal structures - built by Persians. 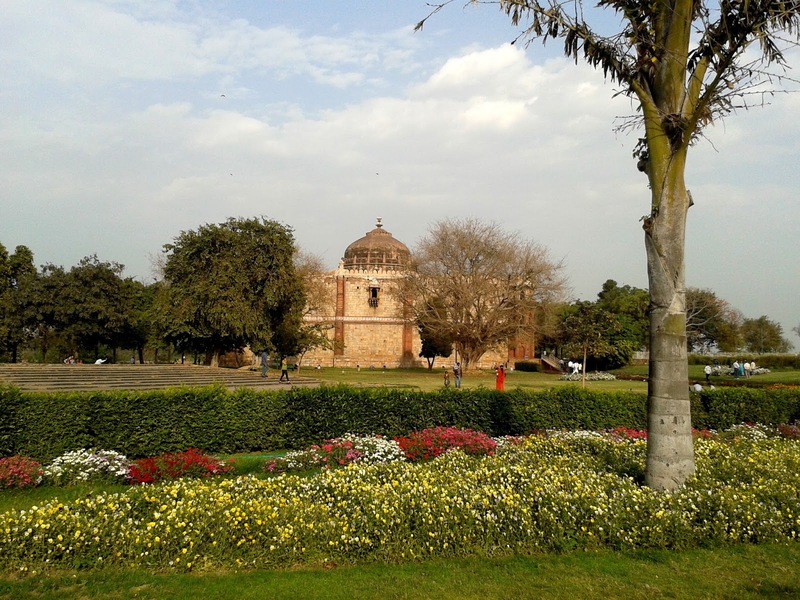 I particularly liked Isa Khan's tomb ( top ) - the gardens are a perfect picnic spot, the walkway around the tomb is quiet and beautiful. 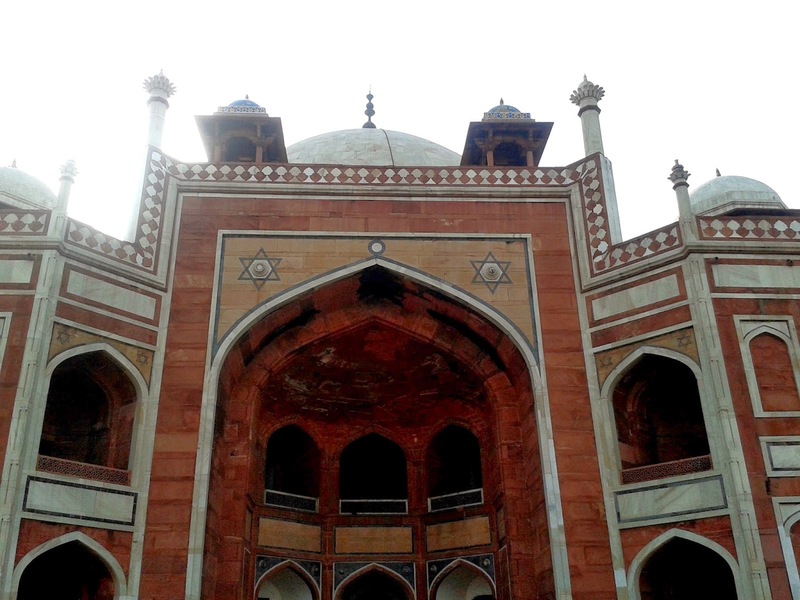 The Humayun's Tomb is well concealed by a huge wall, making it difficult to get a quick peek. 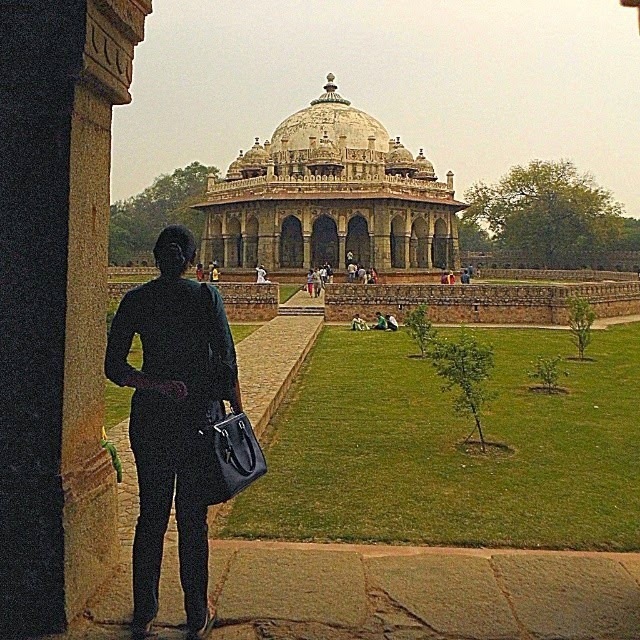 This tomb was one of the first in India to be surrounded by baghs or gardens. Also, one of the first tombs to use red sandstone at such a large scale. Grandiose gestures for the dead I'd say. We walked around Humayan's tomb - occasionally, you could you hear a trains loud whistle - the Nizammudin Railway Station is very close to the tomb. Behind the tomb used to flow the famous Yamuna river. 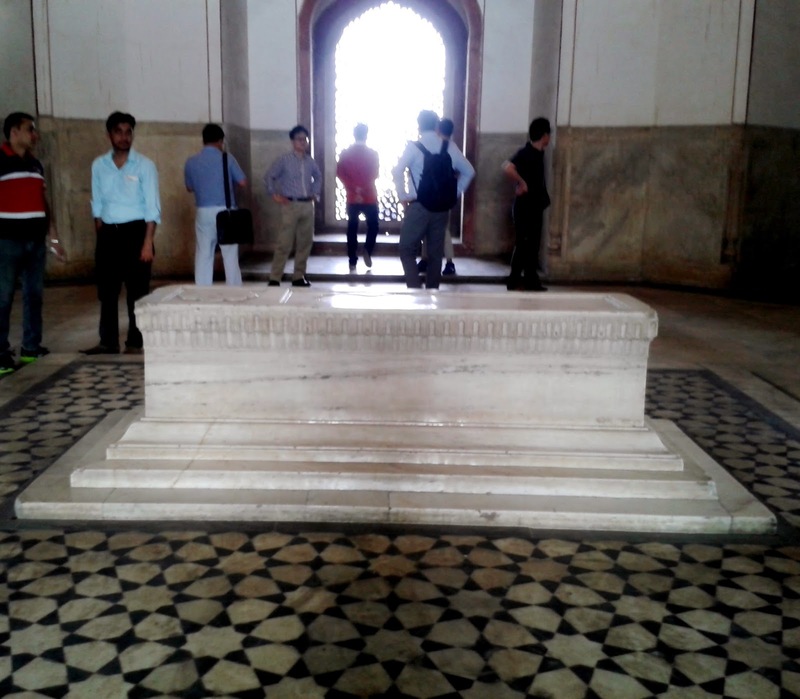 This tomb ( for the public ) has been reconstructed one floor above the original tomb, where no one is allowed to go. 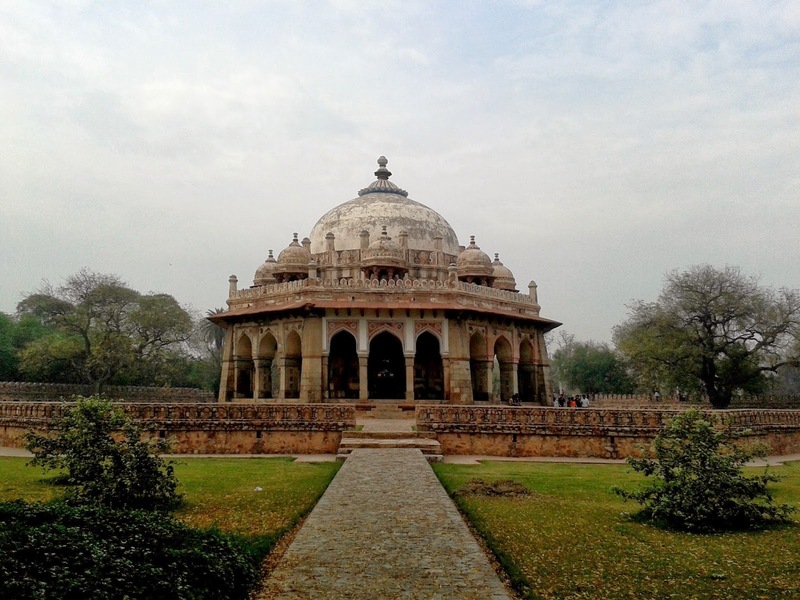 With intricate designs on the dome like ceilings, this tomb attracts hundreds of tourists everyday - apart from the many local Delhi-ites who keep coming back here. 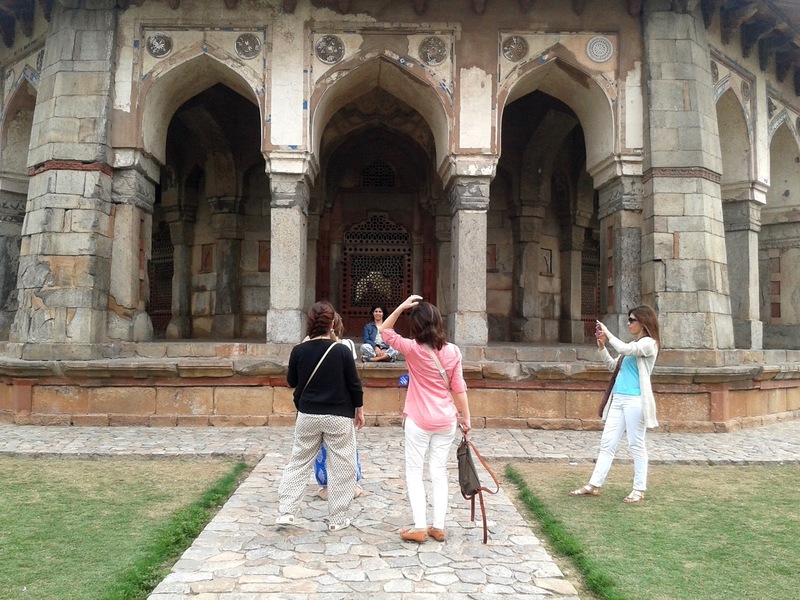 The Mughal Emporer was buried here, though he ruled from the Purana Quila - our next stop. 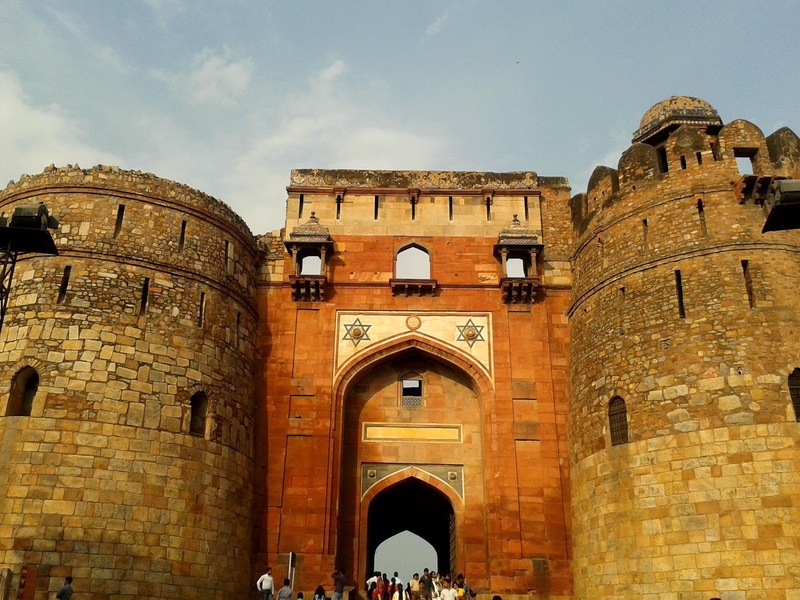 Purana Quila or the Old fort is another UNESCO heritage site and is a protected site. 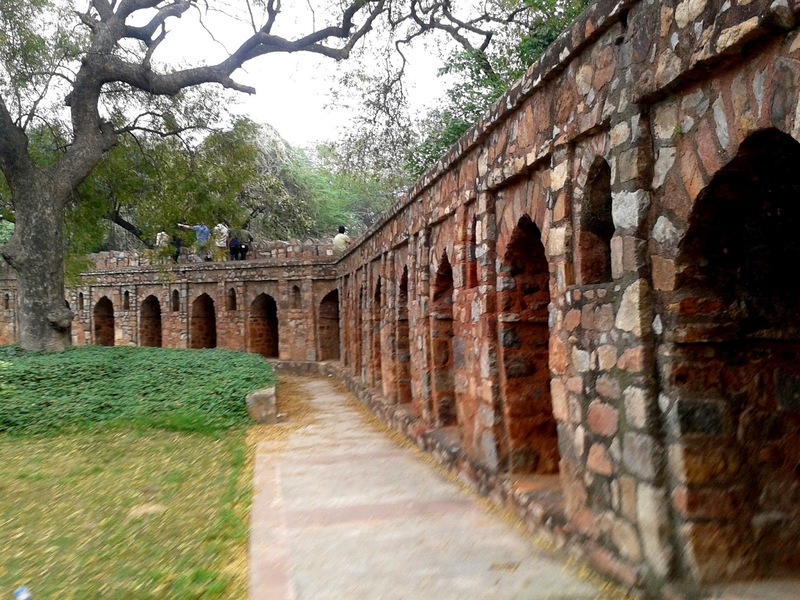 The Fort is the oldest fort in Delhi, in fact, it's the oldest known structure of any type in Delhi. It's located at the site of the legendary city of Indraprastha, that was founded by Pandavas on the banks of perennial river Yamuna, which is revered by Hindus since ages, points to the possibility of this site's history dating back to nearly more than 5000 years old ( From Wikipedia ) This time we went, we actually saw the excavation site that was cordoned off. 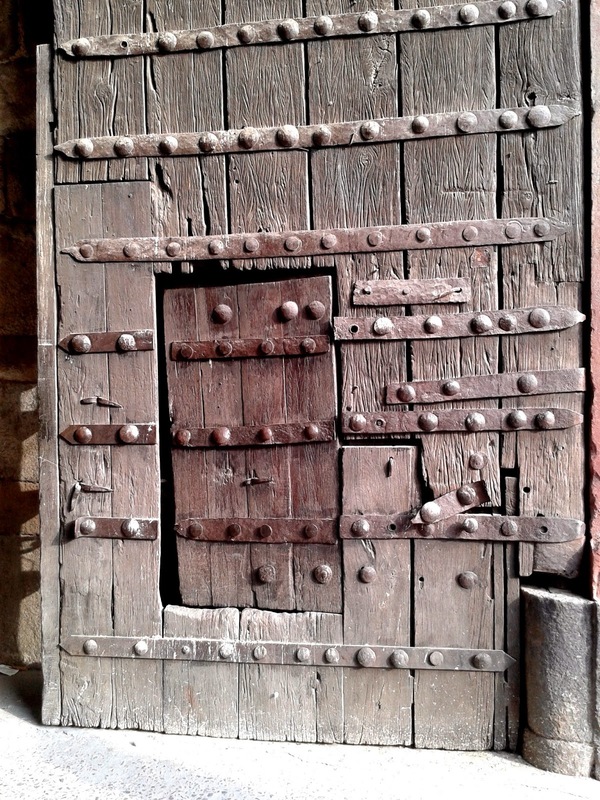 I was quite fascinated by the large wooden carved doors - all of them quite high - I must have posed along most of them am sure ! 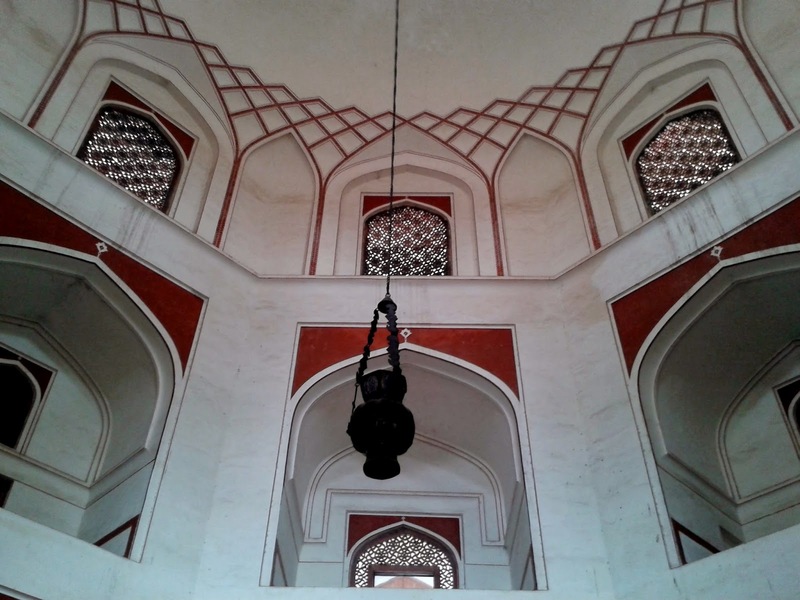 The grand Masjid or Mosque inside the fort is another beautiful structure - in front of which you can find a lot of visitors sitting and relaxing. 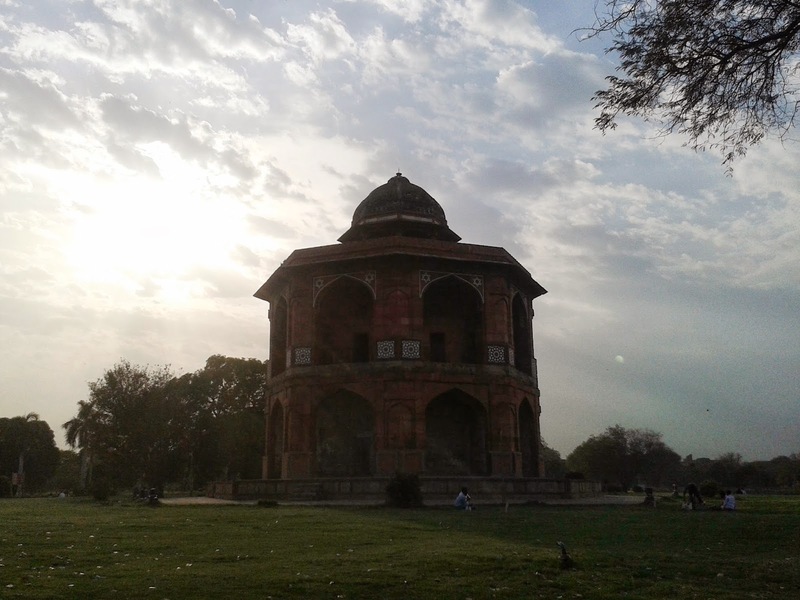 Another octagonal structure that stands alone is the Sher Mandal or 'pleasure chamber' ( yes you read it right ) which was later used as a library by Humayun. 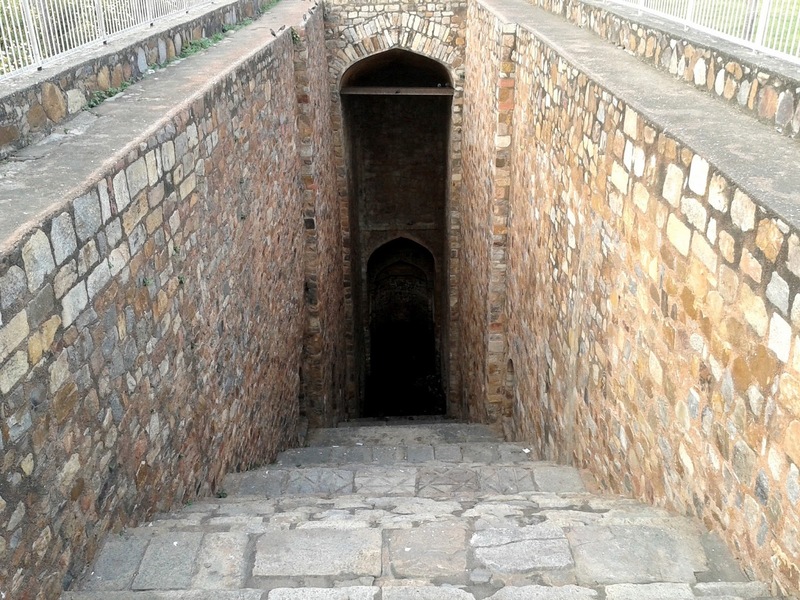 Humayun had a fall from these very steps on the Sher Mandal, and died 3 days later. Baoli or a step well has some of it's steps permanently immersed in water. It's structure is very utilitarian, the water remains covered - the steps make the water accessible. A baoli of this type is seen inside the fort. 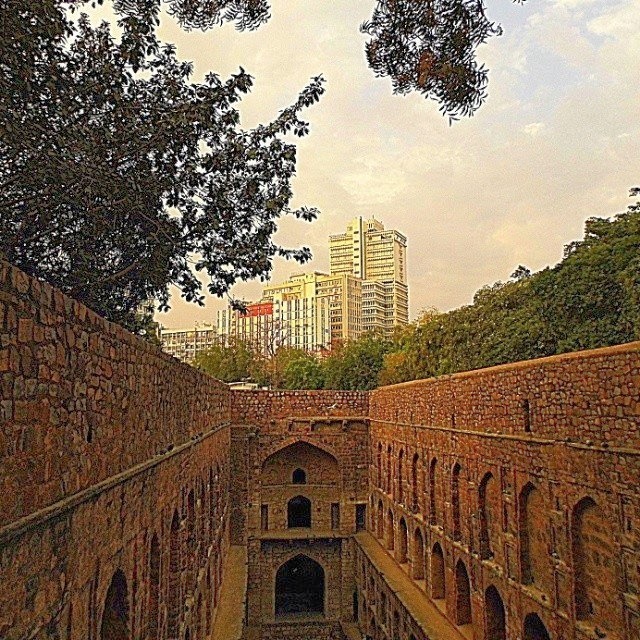 But one of the largest baoli is the largest step wells in Delhi - close to Qutab Minar. Next we went to Agresan ki Baoli - we actually rushed, as it closes just before sun set. We got there in time but could only spend a couple of minutes. I liked a particular shot that @abhiandnow captured. Amidst the busy hustle and bustle in the heart of Delhi - called CP and amongst tall buildings, you can find some peace here. Located on Hailey road, this unassuming space almost hidden away, is another marvel from our rich past. Legend has it that it was built during the Mahabharat epic era. 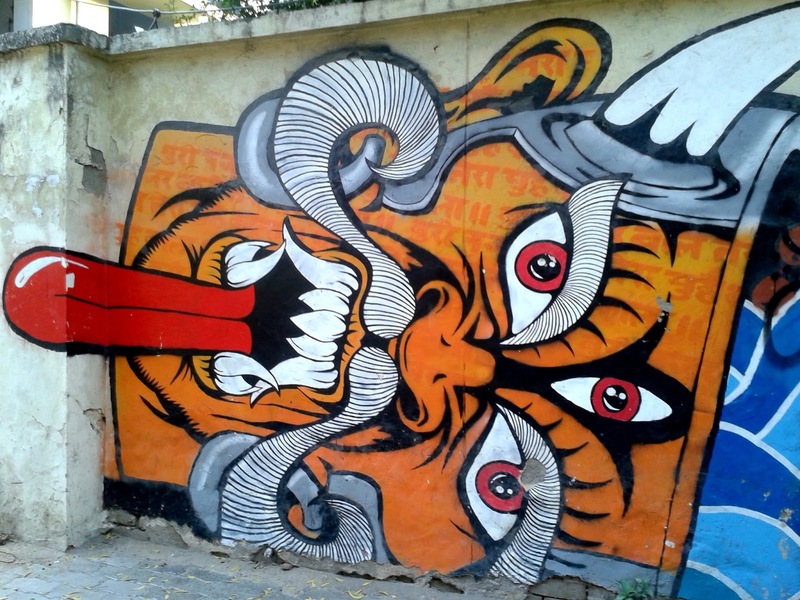 The lane that leads up to the Baoli is filled with creative colorful graffitti on the walls. 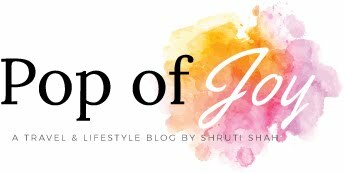 Lovely post :) It's high time that I should see Delhi properly. Hey Rohit ! Thanks :) I haven't heard of Holidify.. 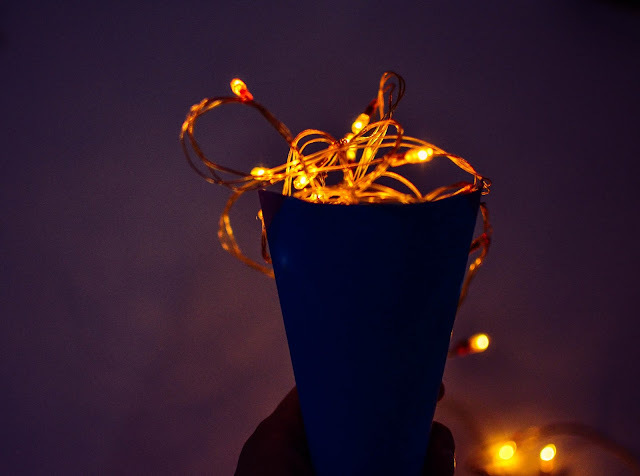 But sure go ahead :) And do share with me the link..